What makes an aortic stenosis patient inoperable? How can we improve on our surgical solutions to save the life of a high risk aortic stenosis case? Well, let me give you first a quick, down-to-earth introduction to the technical aspects involved in a successful aortic valve operation. Once you know what the basic technical challenges and options are, you will appreciate the solutions we have developed in high risk aortic stenosis or insufficiency cases. These new technologies have made a tremendous difference for so many heart patients that were otherwise hopeless and inoperable. Aortic Stenosis. The valve has become heavily calcified and it does not open up wide any more. This situation creates a lethal mechanical obstruction that impairs the ability of the heart to empty out properly with each heartbeat. Fainting spells, dizziness, chest pain, congestive heart failure, swollen legs are characteristic symptoms of this condition. If the valve is not promptly replaced, a patient with symptoms will not survive much longer. Let me put it into prospective for you: Symptomatic aortic stenosis not treated by surgery can cause death much faster than an advanced colon or breast cancer!! Aortic Insufficiency (a leaky valve). The valve cannot close properly and leaks blood backwards. This malfunction causes a chronically overworked heart that becomes progressively weaker and larger. It is sort of a sneaky disease because most patients start to have symptoms of fatigue and shortness of breath only after the leaky valve has caused significant damage to the heart. It is important to realize that many patients with severe leakage of the aortic valve might need surgery before they have symptoms. Waiting until you feel sick is definitely not a good idea. A heart surgeon or a cardiologist should evaluate your heart condition to advise you about the best timing for an aortic valve repair or replacement. The purpose of the aortic valve surgery is to fix the aortic stenosis by removing the calcified, narrow valve and replacing it with a prosthetic valve that opens and closes without effort to reestablish a normal heart function. The vast majority of isolated aortic valve pathologies can be routinely treated through a tiny 2″ incision by a competent minimally invasive heart surgeon. This approach allows even the sickest, elderly and frail (i.e.”inoperable” or high risk) patients a much faster recovery than traditional bone splitting operations. Nothing is further from the truth! Aortic stenosis is actually a typical heart problem of the elderly. Up to 4% of patients over the age of 80 have severe aortic valve stenosis. If an elderly patient can aspire to an improved quality of life following the surgery, it is simply WRONG not to offer this option. The truth is that you might be too old and frail to survive your valve disease without an operation. See my page on minimally invasive aortic valve surgery for more detailed information on this topic. The American College of Cardiology guidelines are very clear about it and specifically say that advanced age is not a contraindication for surgery. They also say that there is no role for medical therapy in symptomatic aortic valve stenosis. In other words, if you do not undergo an aortic valve replacement there are no pills that can save your life! As counterintuitive as it might be medical therapy is much more dangerous than surgery. They might give you some diuretics, such as Lasix or other “water pills” to help you breathe better but that will not fix the unrelenting and lethal mechanical failure of this valve. Aortic valve surgery can be performed by an expert minimally invasive heart surgeon through a tiny 2″ chest wall incision between the ribs. This technique does not break any bone and allows most elderly patients to be out of bed walking the day after surgery with very little pain and a fast recovery and return to an independent life. If that option is not available locally, call our minimally invasive heart center for a second opinion at (330) 588-4676. You should seek a second opinion by an expert heart surgeon to see if you are still a candidate for a surgical AVR, before you accept any other technical solution. I am mentioning this option to help you see through the confusion and misleading information generated by the hype on this new catheter-based technology. This emergent technology is designed to deploy a stent valve in the aortic position through a catheter inserted in the groin with a procedure similar to the one used to carry out an angioplasty and stent for a coronary blockage. Here is what you really need to know: the risk of stroke with a TAVI is three to four times higher than the risk of stroke with a surgical aortic valve replacement. In addition to the stroke rate, there is a much higher incidence of perivalvular leak, a malfunction of the valve related to a faulty seal between the valve and the aortic wall. I can frankly say that I do not know of any cardiologist or heart surgeon who would rather have a higher chance of a stroke and valve malfunction than a tiny scar or a sternotomy on their chest! Another important element is that there are no long term data on these catheter valves in regard to durability, which means that there is no guarantee of how long they are going to last once they are implanted. 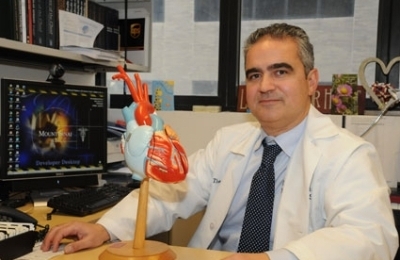 If you’ve been diagnosed as an “inoperable” or high risk aortic valve patient for one of the reasons listed above, it is important that you talk with our expert heart surgeon, Dr. Giovanni Ciuffo, for a second opinion. Contact us online or call (330) 588-4676 to schedule an appointment with Dr. Ciuffo.